The Rugby League Benevolent Fund at heir festival at Wigan St Judes on Saturday 6th October. The RFL Benevolent Fund is deeply saddened to announce the tragic passing of 16 year old Harry Sykes. His family thank everyone for their kind thoughts but wish to be left alone at this most difficult of times. information for companies on how you can make a big difference to our work. 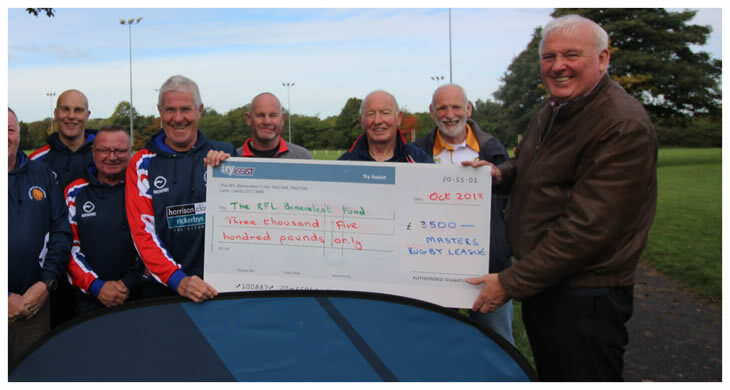 Masters Rugby League presented a cheque for £3500.00 to their chosen charity the Rugby League Benevolent Fund at heir festival at Wigan St Judes on Saturday 6th October. The festival saw a Dads n Lads team 9 father and son pairs all over the age of 35 take on a Great Britain Masters Lions team followed by a regional festival featuring Yorkshire, Lancashire, Cumbria and “other Nationalities” over 100 masters players and their families had a fantastic day enjoying games played in great masters spirit. Martin Flynn said “ today has been a great event and we are delighted to be able to support the Rugby League Benevolent Fund, the money has been raised by team registration fees for the 2018 season. The Benevolent fund is Masters Rugby Leagues chosen Charity and we are happy to be able to support the wonderful work they do”. The family of Harry Sykes have announced the funeral service for Harry will take place at Parkwood Crematorium, Elland, at 3.15 pm on Monday 1st October. This will be followed by a celebration of Harry’s life to be held at Brighouse Sports Club, the home of Brighouse Rangers Rugby League Club. Harry’s family wish to express their thanks to the British Consulate, the RFL Benevolent Fund, and all friends and well wishers who have supported them during this very difficult period. Family flowers only please. A collection will be held for the Harry Sykes Fund to assist local young Rugby League players. A JustGiving page has been set up by the RFL Benevolent Fund to support anyone wishing to make a contribution to the Harry Sykes Fund. Those that wish to wear their club shirts, any rugby shirt, or blue and white to the service will be welcome. 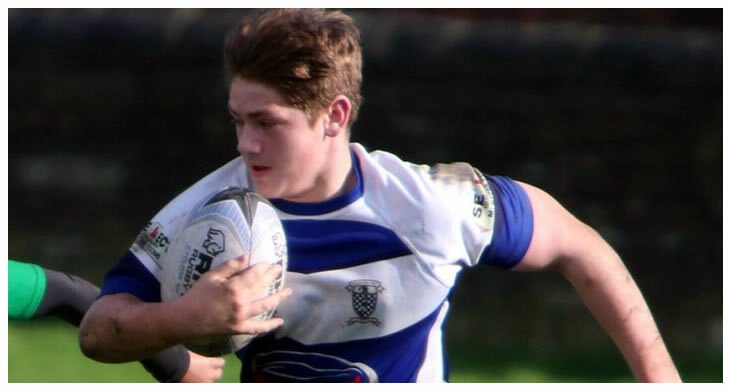 Make a donation to The Harry Sykes Fund at the official Just Giving page here… Issued by the family of Harry Sykes through the RFL Benevolent Fund. The RFL Benevolent Fund is deeply saddened to announce the tragic passing of 16 year old Harry Sykes. His family thank everyone for their kind thoughts but wish to be left alone at this most difficult of times. A further statement will be issued when appropriate. (Issued by the Burton & Sykes family through the RFL Benevolent Fund). Birkenshaw Rugby League Club are sorry to inform of the passing of 32 year old Max Blakeley. Max came off the pitch and later became poorly. Paramedics were called but were unable to revive him. His family have requested privacy at this difficult time. The Club will issue a further statement when appropriate. Scott Rooke was injured whilst playing for Workington Town against Whitehaven in the annual derby clash for the Ike Southward Memorial trophy. 23 year old Rooke remains in Newcastle RVI where he is receiving the best specialist care possible and continues to undergo tests. The RFL Benevolent Fund are in close contact with Scott and have visited him in hospital at Newcastle RVI and will support him and his family through this difficult time. As soon as there is an update on Scott’s condition we will, in conjunction with Scott and his family, release further information. Scott and his family would like to thank everyone for their good wishes and support at this difficult time. Though the tough physical nature of Rugby League is one of the things fans love about the game, it unfortunately means that, on occasion, serious life changing accidents can occur. While these are thankfully rare, the effect on the individuals concerned is devastating. The Rugby League Benevolent Fund was established to help players who suffer such injuries.